You may laugh – you understand? Laugh! 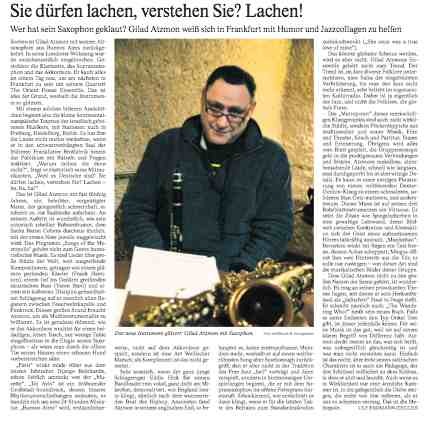 Just now Gilad Atzmon has returned with his alto saxophon from Buenos Aires. In the meantime his flat in London was burgled. His clarinet, the soprano saxophon and his accordion were all stolen. The same day he bought all these instruments anew because he was supposed to be in Frankfurt the following day together with his quartet – The Orient House Ensemble. That was the reason his instruments were shining so much. With such a bitter litte anecdote the continental European tournee of the Israel born musician started, with stations in Freiburg, Heidelberg and Berlin. It had not totally spoiled his parade when troubling his audience with riddles and questions in the totally black coated hall of a former Frankfurt bread factory. “Why on earth don`t you laugh?” he askes his musicians. “Because they are Germans! You may laugh, you know. Laugh, ha, ha, ha”! Tis is Gilad Atzmon, almost 50 years old, a corpulent and spiritually minded man sometimes glancing up to the ceiling in a painstrikken way. During his performance it is strange how his notoriously shrill sense of humour on stage, quite similar to that of Sacha Baron Cohen, is always brushed aside with the first sound of music. His program “Songs of the Metropolis” is not part of the genre of humorous music. They are songs about the great cities of the wolrd, great compositions supported by a glasslike sparkling piano (Frank Harrison), an acoustic bass reverberating deep into the indestines (Yaron Stavi) and a drum set played with extreme discipline with almost all registers between fire brigade band and funkrock. Atzmon needs this great sound in order to deliver a brilliant performance as multi-instrumentalist. It is very moving how he works on his accordeon for a casual and silent fanfare, only a few beats (tacts) plaited in the elegy of his saxophone – as if seeing a shy dog straying past. “Paris” is wearily waiving from the past Django Reinhardt century, already lovely entwined by the “Musette”. “Tel Aviv” is a booming city soundtrack its bizzare shifts of rhythm denoting as if it was a 24 hour miniature. Amazingly, “Buonos Aires” ist not played on the accordeon, but as a kind of Weill marsh; this is not meant to be a compliment. It is very funny when the very young drummer Eddie Hick demonstrates for his bandleader purely vocal, close to the microphone, how England sounds, to be specific like the banging Hiphop beat. Otherwise Atzmon claims he did not find any more metropolitan melodies in his English exile. That is why he came back to the world famous song about Scarborough. But he does not safely play it in the tradition of free jazz and thus overplay it, but starts with some double-edged detours shouting them out with his soprano saxophon into the open Fortepiano. It is shocking the way it sounds when he returns for the last beats of the refrain to the main microphone (“She once was a tru love of mine”). This may turn to a global soft soap, but it does not. Gilad Atzmon’s ensemble is not part of this trend. It is the common trend to mix diverse folklore with jazz, a salsa of fancied fraternization until you do not recognize the jazz any longer, which is very popular in the so-called culture radio. It is actually jazz and not folklore which is the global form of music. The “Metropolises” of this strange sound project are not real cities but rag rugs made of traditional and new music, film and theatre, noise and score, dream and recollection. After all everything is sight-read. The group’s energy goes into accurate connections and fractions. Atzmon`s faultless and breathtaking music cycles, fast or slow, are intensely practised even to ludicrous details. In one single phrase he manages to mutate from a fully sounding Dexter-Gordong-sound to a small and solid one of Stan Getz and vice versa. This man is virtuoso playing his reed instruments. He sets his citations like mirror peaces on a huge screen, the pictures of which wether concrete or abstract can be well imagined by an attentive listener. “Manhatten”: While it is raining Bernstein is waving to a taxi the axis of which is rattling. Mignus sitting on the back seat opens the door for him, he should come in – the musical images of this group are of this kind. That Gilad Atzmon does not belong to the great names of the in-crowd, is somehow strange. It may be due to his provoking assumptions by questioning his birth place as a “jewish” state. He also wrote: “The Wandering Who?” which is the title of his new book. In case there should be the type of uncle Tom within the exiles, at any rate, this man is not. For his music this is fine, because it rests upon a clear definition of difference. Atzmon always thinks of things that do not fit, concepts beyond comprehension and at the same time one does not understand. This is not simple; but in spite of his satirical character he is also a teacher providing the key to the castle in which he is sitting and listening. But even if this is turning out to be a small and humble room, which thieves now and then tend to board and stealing more of the things than he is able to give us as a present.